Piggy-back cylinders, as the name implies, are two opposing hydraulic cylinders mounted with the bodies on top of each other. Taking advantage of this configuration enables a longer stroke from a relatively short overall length. They’re somewhat similar to familiar telescoping cylinders, where several cylinder stages are built inside of one another, and the unit features relatively short retracted length but long extended length. But when only two stages are required, a piggy-back cylinder can be a simpler and more-economical alternative. 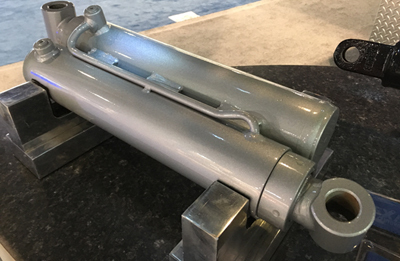 Piggy-back cylinders from Texas Hydraulics on display at IFPE. Piggy-back cylinders from Texas Hydraulics, Temple, Tex., are made of two rod cylinders with the barrels welded or bolted together. They’re designed for applications with limited mounting space that require a long extended length and a short retraction length. They provide consistent force and speed, and they’re suited for low and high-pressure applications. Usually, the two cylinders have the same bore and stroke, and only one hydraulic line each is needed for extension and one line for retraction. This simplifies plumbing and limits potential leak points. Units with the same bore sizes also have interchangeable seals. Optional features include rod or tube porting, integrated valving and built-in cushions. Piggy-back cylinders can also be designed for sequencing and multiple stopping points. For instance, by specifying a different stroke for each cylinder, and adding hydraulic lines for each, four different positions can be controlled: when both cylinders are retracted, when only the first cylinder extends, when only the second extends, and when both cylinders extend. The versatile cylinders are suited for many applications across various industries. Examples include jack/outrigger extension, boom extension, wreckers and tow vehicles, truck-mounted cranes, chutes and dump applications. Very interesting indeed, but the title of the article is “The ins and outs of piggyback hydraulic cylinders”. Looks like you forgot to spend few words about the outs.